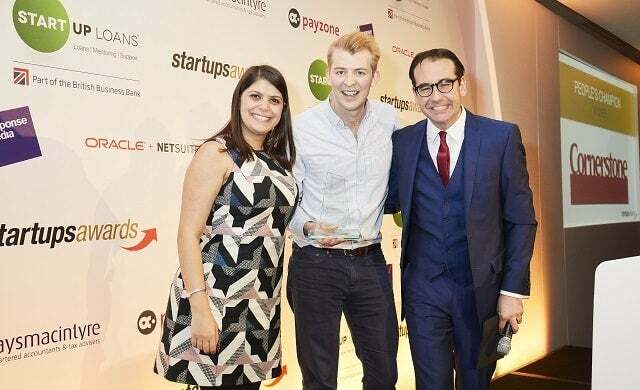 For an unprecedented third year running, shaving kit subscription service Cornerstone has been crowned the People’s Champion at the Startups Awards, having amassed thousands upon thousands of votes. The award – voted for by fellow businesses and the public – closes off a year that has seen Cornerstone founder Oliver Bridge inducted into the Young Guns Class of 2017 (the annual index of the UK’s most talented young entrepreneurs) and break into the top 10 of the Startups 100. And that’s not all. In August of this year, Cornerstone landed a £3.5m funding round led by private equity firm Calculus Capital. The funding has supported the start-up’s aggressive marketing campaign, which has seen its adverts feature in primetime TV slots during Tottenham Hotspur, Real Madrid and Manchester United’s Champion’s League games. This is being run for the remainder of the year alongside an out-of-home advertising campaign. Having proclaimed an “all-out assault on the men’s aisle at Boots”, Bridge has never been shy of ambition, and has even revealed his intention to sell the business for £100m by 2020. On the back of “countless suggestions” from its members, early next year, Cornerstone will launch a whole range of quality bathroom products including hair-strengthening shampoo, whitening toothpaste, multi-vitamins, floss tape, mouthwash, toothbrush heads, and deodorant. This will coincide with a complete revamp of Cornerstone’s website and subscription service , with the option to “fully automate your bathroom cupboard”. Boasting green credentials – all of its products are not tested on animals, contain no parabens, BPA or microbeads – it’s clear that Bridge’s business is a fan favourite and serves up an inspiring story on how to make customers fall in love with your brand! With more than 40,000 votes cast, Cornerstone beat off stiff competition from on-demand dog food start-up tails.com; winner of Highly Commended with the second highest number of votes, and gin subscription service Craft Clubs; which takes Commended with the third largest number of votes.